Various senses and sensory nerve architectures of animals have evolved during adaptation to exploit diverse environments. In craniates, the trunk sensory system has evolved from simple mechanosensory neurons inside the spinal cord (intramedullary), called Rohon-Beard (RB) cells, to multimodal sensory neurons of dorsal root ganglia (DRG) outside the spinal cord (extramedullary). The fish and amphibian trunk sensory systems switch from RB cells to DRG during development, while amniotes rely exclusively on the DRG system. The mechanisms underlying the ontogenic switching and its link to phylogenetic transition remain unknown. In Xenopus, Six1 overexpression promoted precocious apoptosis of RB cells and emergence of extramedullary sensory neurons, whereas Six1 knockdown delayed the reduction in RB cell number. Genetic ablation of Six1 and Six4 in mice led to the appearance of intramedullary sensory neuron-like cells as a result of medial migration of neural crest cells into the spinal cord and production of immature DRG neurons and fused DRG. Restoration of SIX1 expression in the neural crest-linage partially rescued the phenotype, indicating the cell autonomous requirements of SIX1 for normal extramedullary sensory neurogenesis. Mouse Six1 enhancer that mediates the expression in DRG neurons activated transcription in Xenopus RB cells earlier than endogenous six1 expression, suggesting earlier onset of mouse SIX1 expression than Xenopus during sensory development. The results indicated the critical role of Six1 in transition of RB cells to DRG neurons during Xenopus development and establishment of exclusive DRG system of mice. The study provided evidence that early appearance of SIX1 expression, which correlated with mouse Six1 enhancer, is essential for the formation of DRG-dominant system in mice, suggesting that heterochronic changes in Six1 enhancer sequence play an important role in alteration of trunk sensory architecture and contribute to the evolution of the trunk sensory system. Trunk sensory neurons convey somatic and visceral information to the central nervous system (CNS). Rohon-Beard (RB) cells are known to mediate the sensory pathway in fish and amphibian larvae [1–5]; however, this cell type has not been identified in avian and mammalian species [6, 7] (Figure 1A). In fish and amphibians, RB cells are located in the dorsal part of the spinal cord and have peripheral and central neurites. The peripheral neurites innervate the skin of the trunk, while the central neurites descend and ascend over several segments within the spinal cord, ultimately reaching the brainstem [2, 8]. At later larval stages, RB cells undergo cell death by apoptosis. Concomitantly, neural crest cell (NCC)-derived extramedullary sensory ganglia (dorsal root ganglia; DRG) develop and begin to process mechanosensory inputs . At present, evidence suggests that the body organization of cephalochordate Amphioxus reflects the early primitive condition of chordate. Although it lacks extramedullary sensory neurons, equivalent to DRG neurons, it has two types of intramedullary neurons comparable to RB cells of anamniotes, Retzius bipolar cells in larvae [10, 11] and DRiii cells in adult . In agnathan lampreys, both RB cells and extramedullary sensory neurons are present, but their spinal roots are primitive and asymmetrical . Due to the ontogenic transition in anamniotes from RB cells to DRG neurons and phylogenetic disappearance of RB cells in amniotes, intramedullary cells are regarded as the prototype of sensory neurons in chordates (Figure 1A). Expression of Xenopus Six1 appears during transition from Rohon-Beard cells to dorsal root ganglia. (A) Cladogram showing the succession of primary sensory neurons of chordates in the trunk. Intramedullary primary sensory neurons, called Rohon-Beard (RB) cells, dorsal cells, Retzius bipolar cells or DRiii cells (pink), are recognized in various species [5, 6] - including amphioxus ; lampreys: Lampetra planeri, Lampetra japonica; fish: Lepisosteus osseus, Raja (Dipturus) batis, Scyliorhinus torazame, Danio rerio; and amphibian: Ambystoma punctatum, Xenopus laevis, Rana pipiens, Rana catesbeiana, Ceratophrys ornata, Eleutherodactylus coqui - but not in amniotic vertebrates [6, 7]. Craniates have extramedullary sensory neurons (blue) that are derived from neural crest cells and form dorsal root ganglia (DRG). (B-D) Distribution of Six1 mRNA and protein in the trunk region of Xenopus embryos (dorsal side: top of transverse sections). Developmental stages are indicated at top line. Arrowheads: Six1-negative RB cells; arrows: Six1-positive RB cells. (B, C) In situ hybridization of six1 (purple) is followed by immunostaining of Isl1/2 (orange), marking RB cells and DRG neurons. (B’, C’) Magnified views of the areas indicated by the rectangles in B and C. (D) Detection of Six1 (green) and Isl1/2 (magenta) by immunofluorescence in sections adjacent or alternate to those in B and C. Dashed lines demarcate the position of the spinal cord. sc, spinal cord; so, somite. Scale bars: 25 μm (B-D) and 10 μm ( B’, C’). Both RB cells and NCCs arise from the cells present at the border of the neural- and non-neural ectoderm and both require similar inductive signals including bone morphogenetic proteins . Notch/Delta signaling alternatively determines their fates; it promotes RB cell fate at the expense of NCC-derived cell types [24, 25]. Whereas NCCs undergo epithelial-to-mesenchymal transition and migrate to their final destinations, including DRG , RB cells migrate medially from the border and are finally incorporated into the medulla [27–29]. RB cells extend their neurites and mediate the sensory circuits required for rhythmic swimming and predator avoidance [30, 31]. At the approach of metamorphosis, the functions of RB cells are superseded by DRG neurons, and the death of RB cells is induced by the attenuation of TrkC1/NT-3 signaling . Although previous studies shed light on the induction, specification and differentiation processes of RB cells in zebrafish and Xenopus, the molecular mechanisms underlying the replacement of RB cells with DRG neurons remain largely unknown. Unveiling such mechanisms should enhance our understanding of the evolution of sensory architecture, particularly the emergence of DRG in craniates and subsequent disappearance of RB cells in amniotes. In the cranial region, the Six1 homeobox gene is considered the main player in the genesis of sensory organs: loss of function of Six1 causes severe defects in various sensory organs that originate from the cranial sensory placodes in zebrafish [34, 35], Xenopus[36, 37], mouse [38–43] and humans [44–46]. The expression of Six4, another Six family gene, shows a similar pattern, and simultaneous loss of both genes aggravated the defects in mice [47–49]. While Six1 and Six4 are also expressed in DRG in the trunk [40, 50], the functional significance of the two genes in the development of DRG neurons and RB cells has not been explored. In the present study, we found that Six1 is expressed in Xenopus RB cells just before apoptotic cell death. Experiments involving Six1 overexpression and knockdown demonstrated that Six1 is a key molecule for the ontogenic transition of RB cells to DRG neurons during development. Moreover, in mice, SIX1 and SIX4 were essential for the normal development of DRG, and loss of both genes allowed the emergence of intramedullary sensory neuron-like cells, as a result of immigration of NCCs into the spinal cord. We also investigated the molecular basis of the differential onset of Six1 expression in both Xenopus and mouse. The results showed changes in the activity of a conserved enhancer. Based on these results, we suggest that heterochronic shift in Six1 expression contributes to phylogenetic transition in the architecture of sensory neurons. To investigate the functions of both Six1 and Six4 in the development of trunk sensory neurons, we first examined their expression patterns in Xenopus embryos (Figure 1B,C). RB cells are characterized by their large size and dorsal location in the spinal cord and their nuclei are positive for Isl1/2(Islet1/2) [51, 52]. No mRNA or protein expression of Six1 and Six4 was observed in RB cells at stages (St.) 16/17, 25/26 and 33/34 (arrowheads in Figure 1B,C; Additional file 1). However, Six1 mRNA and protein expression was recognized in RB cells at St. 43 (arrows in Figure 1B,C). The majority of DRG neurons (identified by their Isl1/2-positive nuclei and location within the dorsal root) were positive for Six1 from St. 49 to 60. The number of RB cells started to decrease at around St. 46 due to apoptosis . These findings indicate that Six1 expression appears before apoptosis of RB cells, and persists during DRG formation in Xenopus development, although both are trunk sensory neurons. The above findings suggested that Six1 is a key regulator of apoptotic death of RB cells and the development of DRG during the transition of sensory neurons in Xenopus. To test this notion, we investigated the effects of Six1 overexpression and knockdown (Figure 2). To avoid any disturbance of early embryonic development, especially placodal development and early neuronal differentiation , we utilized a steroid hormone-inducible system . We generated mRNA encoding Xenopus Six1 fused to the glucocorticoid receptor ligand-binding domain (GR) (Six1-GR) and injected it into V1.2 blastomeres at the 16-cell stage. During normal development, the blastomeres give rise to the dorsal spinal cord and ectoderm, including RB cells  (Additional file 2A). Six1-GR was then activated by adding dexamethasone (Dex) at St. 16/17, at the time when the majority of RB cells had already exited the cell cycle . The embryos were analyzed at St. 25/26. 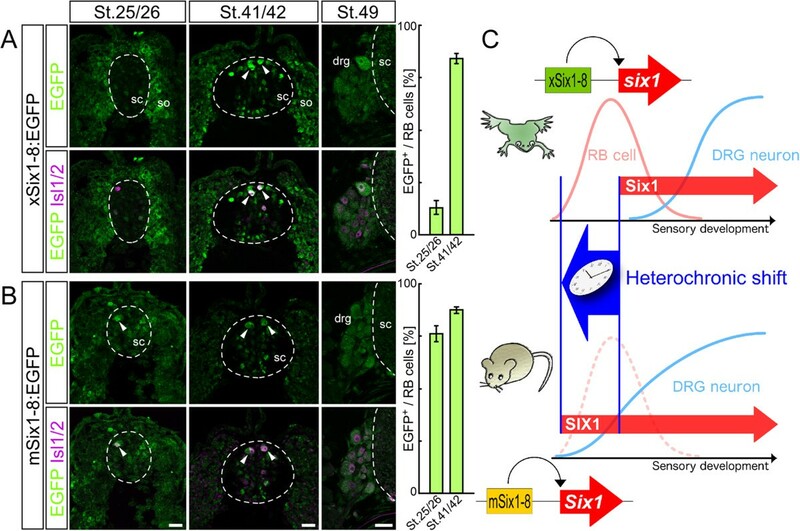 Six1 mediates the developmental transition of trunk sensory neurons during Xenopus development. (A-K) Earlier expression of Six1 reduces the number of Rohon-Beard (RB) cells and promotes differentiation of extramedullary sensory neurons in Xenopus. (A-E) The combinations of injected mRNAs and treatment with dexamethasone (Dex) are indicated at the top. Arrowheads: enhanced GFP (EGFP)-positive RB cells, which are marked with both Isl1/2 (magenta) and Tlx3 (green) in the spinal cord (sc) at St. 25/26 (A-D). Arrows: EGFP-, Isl1/2- and Tlx3-triple-positive cells outside sc at St. 33/34 (E). (F) Quantification of RB cells and (G) percentage of EGFP-positive RB cells in 250 μm of the thoracic level at St. 25/26. White bars: total number of RB cells, green bars: EGFP-positive cells. (H) EGFP- and cleaved CASP3 (cCasp3)-double-positive cells (arrowheads) are noted in Six1-GR + Dex. (I) In Six1-GR + Dex embryos, Isl1/2- and EGFP-double positive cells (arrow) are located outside sc. Laminin (green): sc outline, TOPRO3 (magenta): nuclei. (J) Quantification of Isl1/2- and Tlx3-double positive cells outside sc. White bars: total number of cells, green bars: EGFP-positive cells. (K) Schematic representation of the results. Activation of Six1 reduced the number of RB cells (pink) in sc and enhanced the differentiation of DRG neuron-like cells (blue) outside sc. (L-N) siRNA mediated knockdown of Six1 increased the number of RB cells. (L) Top: schematic representation of electroporation of Xenopus embryo. Bottom: merged picture of epifluorescence and bright field in obliquely dorsal view of the trunk at St. 45. Fluorescein isothiocyanate-labeled control small interfering RNA (siRNA) persists in the dorsal sc. (M) si1, si2 and si3: siRNA targeted sequences in six1; mut: three silent mutations, each corresponding to siRNA targeted regions in mutated six1. (N) Number of Isl1/2-positive RB cells in the trunk (level in somite (so) pairs 1 to 9) at St. 45/46. Data are mean ± standard error of the mean. *p <0.01; **p<0.001. Dashed lines demarcate the position of sc and notochord (nc). Scale bars: 100 μm (L) and 25 μm (A-K,M,N). In all experiments, enhanced GFP (EGFP) mRNA was co-injected to trace the distribution and lineage of the injected cells. RB cells, which are positive for both Isl1/2 and Tlx3 (XHox11L2) , were effectively labeled with EGFP in embryos injected with mRNA encoding β-globin as a control (Figure 2A). Dex-treatment did not alter the distribution or number of RB cells, or the proportion of EGFP-positive RB cells in embryos injected with β-globin mRNA (39.5 ± 2.6 cells in -Dex, n = 12; 34.9 ± 2.3 cells in + Dex, n = 11; Figure 2B,F). The number of RB cells in embryos injected with Six1-GR mRNA decreased significantly to 25.5 ± 2.0 cells (n = 17, p = 0.0002) after Dex-treatment, compared with Dex-untreated control (40.1 ± 2.8 cells, n = 16; Figure 2C,D,F) and with β-globin mRNA-injected embryos (Figure 2F). The fraction of EGFP-positive RB cells was also reduced by Dex-treatment (Figure 2G). To determine whether the observed reduction in RB cells was due to apoptosis, which is known to occur later during normal development, we performed immunostaining for cleaved CASP3 (Caspase-3). No signal was detected in the EGFP-positive cells within the dorsal spinal cords of embryos injected with Six1-GR mRNA and untreated, whereas the signal was clearly detected in Dex-treated embryos at St. 25/26 (Figure 2H). These findings suggest that precocious expression of Six1 accelerates the disappearance of RB cells, at least in part, through the induction of apoptosis. Surprisingly, at St. 33/34, Isl1/2- and Tlx3-double-positive cells were observed outside the spinal cord in the Six1-GR-overexpressing and Dex-treated embryos (7.2 ± 1.2 cells, n = 13), but rarely in the control embryos (1.1 ± 0.6 cells in β-globin -Dex, n = 9; 0.4 ± 0.3 cells in β-globin + Dex, n = 9; 1.0 ± 0.3 cells in Six1-GR -Dex, n = 12; Figure 2E,I,J). Importantly, most of these cells were positive for EGFP (93.5 ± 3.3%), suggesting cell-autonomous effect of Six1-GR activation. Although Isl1/2 and Tlx3 are markers for both DRG neurons and RB cells (Additional file 2B), the extramedullary and ventrolateral location of Isl1/2- and Tlx3-double-positive cells suggests that these sensory neuron-like cells are closely related to DRG neurons (Figure 2K). Taken together, these findings suggest that overexpression of Six1 promotes premature differentiation of extramedullary neurons in Xenopus embryos. To evaluate the effects of loss-of-function of Six1 on the transition of trunk sensory neurons, small interfering RNAs (siRNAs) were introduced into the dorsal spinal cord through electroporation (Figure 2L). We generated three different siRNAs for Six1 (Figure 2M). The knockdown efficacy of the mixture of Six1 siRNAs was verified in HEK293 cell line (Additional file 2C). To avoid disturbance of early development by Six1 siRNAs, electroporation was performed on St. 34/35 embryos, before the onset of cell death . Because the maximum number of RB cells appears at St. 41 and the number falls thereafter  (Additional file 2D), counting of RB cells in the trunk region (in somite pairs 1 to 9) was conducted at St. 45/46 (Figure 2N). The number of RB cells significantly increased from 70.1 ± 4.6 cells in the control embryos (n = 21) to 90.5 ± 6.4 cells in embryos electroporated with the Six1 siRNAs (n = 15, p = 0.01; Figure 2N). To validate the specificity of the Six1 siRNAs, we performed a rescue experiment by employing Six1-containing silent mutations in the siRNA target sequences (Figure 2M), which was resistant to our siRNAs (Additional file 2C). Co-electroporation of Six1 siRNAs with the mutated six1 mRNA reversed the knockdown effect of siRNAs (50.2 ± 3.6 cells, n = 22, p = 0.000001) (Figure 2N), confirming that the knockdown of Six1 itself causes a delay in the reduction of the number of RB cells. Taken together, the above findings indicate that early expression of Six1 leads to a decrease in the number of RB cells, while it promotes extramedullary sensory neurogenesis. Additionally, knockdown of Six1 leads to delay in the reduction of RB cell number. Based on these results, it is conceivable that Six1 is involved in purging RB cells and promoting the formation of DRG during Xenopus development. We next examined the roles of SIX1 and SIX4 in the development of sensory neurons in the trunk of mice. Immunofluorescence staining with specific SIX1 and SIX4 antibodies [39, 48] (Additional file 3A) showed similar distribution patterns for SIX1 and SIX4 proteins in the DRG at embryonic day (E) 11.5 (Additional file 3B). SIX1 was located in approximately 50% of the ISL1/2-positive neurons (Figure 3A,B), but not in SOX10-positive undifferentiated NCCs or glia (Figure 3C). We described previously the generation of Six1 and Six4 knockout alleles that harbor EGFP and LacZ genes, respectively [48, 57]. Because heterozygous embryos harboring the two knockout alleles (Six1 +/- /Six4 +/- , denoted as Six1/4 +/EGFP ) did not exhibit obvious anomalies in DRG development (Figure 3A-C), we used them to examine Six1 expression by monitoring green fluorescence. EGFP-positive soma in Six1/4 +/EGFP embryos was mostly positive for ISL1/2 immunofluorescence (Figure 3D), indicating activation of the Six1 locus in the majority of ISL1/2-positive neurons at some point during differentiation, because EGFP protein can reside in cells for a longer period than SIX1 protein. These observations point to the potential role of SIX1 in differentiation of NCC into DRG neurons. SIX1 is crucial during mouse dorsal root ganglia development. (A-D) Immunofluorescence of SIX1 (green), neuronal marker ISL1/2 (magenta) and glial marker SOX10 (magenta) in dorsal root ganglia (DRG) of embryonic day (E) 11.5 Six1/4 +/EGFP embryos, in which the Six1-locus directs the expression of enhanced GFP (EGFP; green). (E-P) Abnormalities in Six1/4 EGFP/EGFP DRG. (E,F) Arrowheads: ISL1/2 (green)- and SOX10 (magenta)-double-positive cells; arrows: ventrally located ISL1/2-positive cells (F), which were never observed in Six1/4 +/EGFP at E11.5 (E). (G,H) Coronal sections of lumbar region at E14.0 (top: rostral side). DRG are fused over several segments in Six1/4 EGFP/EGFP embryos (square bracket in H), but segmented in Six1/4 +/EGFP (arrows in G). (I-P) Transverse sections of dorsal spinal cords (sc) at E11.5. Arrowheads: intramedullary EGFP (green)-, ISL1/2 (magenta)- and NTRK3 (magenta)-triple-positive cells only in Six1/4 EGFP/EGFP ; arrows: EGFP-positive afferents at the dorsal root entry zone. Dashed lines demarcate the position of ectoderm and sc. Scale bars: 200 μm (G,H) and 50 μm (A-F,I-P). The DRG of double-knockout embryos (Six1 -/- /Six4 -/- , denoted as Six1/4 EGFP/EGFP ) were smaller and flat mediolaterally compared to those of the wild type and Six1/4 +/EGFP at E11.5 (Figure 3E,F). In addition, ISL1/2-positive neurons were dispersed and emigrated ventrally compared with those in Six1/4 +/EGFP (Figure 3E,F). Furthermore, ISL1/2- and SOX10-double-positive cells, which are reminiscent of immature NCCs, were frequently observed (n = 19, Figure 3F), whereas such cells were rarely recognized in wild type and Six1/4 +/EGFP (Figure 3E). Finally, the lumbar DRG was found to fuse later in the development of Six1/4 EGFP/EGFP (Figure 3G,H). Considered together with the lack of significant developmental anomalies in DRG in Six1 and Six4 single-knockout embryos [50, 58], these findings suggest mutually compensatory roles for SIX1 and SIX4 in the differentiation and migration of DRG cells and gangliogenesis. The axonal bundle at the dorsal root entry zone (DREZ)  was also positive for EGFP in Six1/4 +/EGFP at E11.5 (arrows in Figure 3I,K). This was owing to intracellular diffusion of the long-lasting EGFP protein, indicating that the sensory afferents originated from SIX1-positive neurons in DRG. 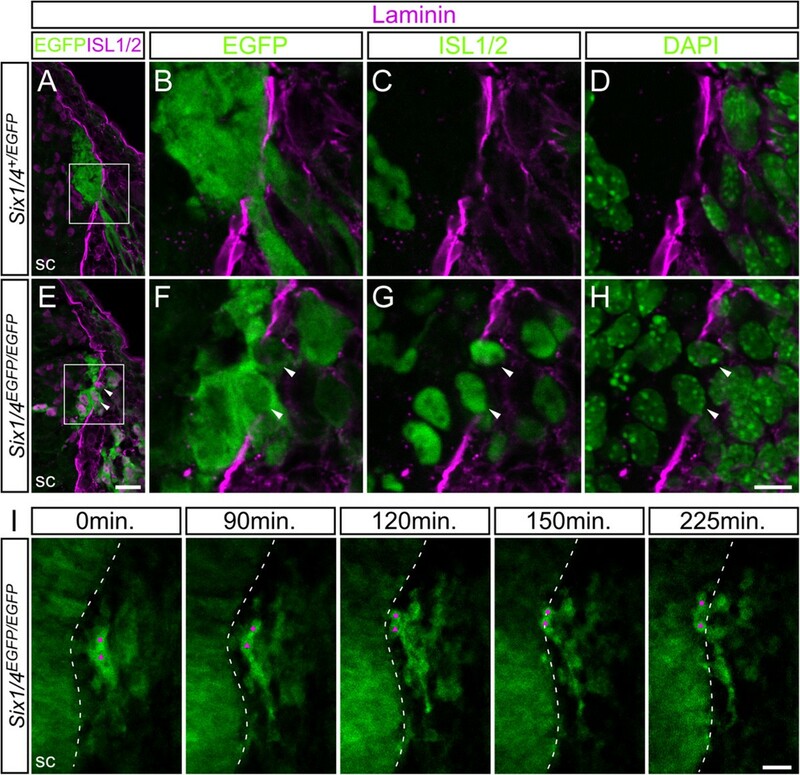 Surprisingly, EGFP- and ISL1/2-double-positive cells were noted inside the spinal cord near the DREZ of Six1/4 EGFP/EGFP (n = 19, Figure 3J,L), whereas these cells were hardly observed in Six1/4 +/EGFP (n = 17, Figure 3I,K). The EGFP- and ISL1/2-double-positive cells in Six1/4 EGFP/EGFP also showed immunofluorescence signal for NTRK3 (TrkC) (n = 6, Figure 3N,P), a marker of proprioceptive neurons of the DRG . By contrast, the NTRK3 signal was observed only in the axonal bundle of DREZ in the spinal cords of Six1/4 +/EGFP (n = 5, Figure 3M,O). These findings suggest the novel roles for SIX1 and SIX4 in the development of DRG and preclusion of intramedullary sensory neurons. To define the properties of intramedullary EGFP-positive cells in Six1/4 EGFP/EGFP , we first assessed the projection of neurites. The retrograde tracer rhodamine-dextran was injected into a region outside the spinal cord in E11.5 embryos and subsequently observed in EGFP-positive soma in the spinal cords of Six1/4 EGFP/EGFP (n = 3, Figure 4B). By contrast, the tracer was noted only in the sensory axon bundle at the DREZ of Six1/4 +/EGFP (n = 3, Figure 4A). These results indicate that these EGFP-positive cells in Six1/4 EGFP/EGFP extend their processes outside the spinal cord. In the thoracolumbar region of wild-type mouse spinal cord, only somatic motor neurons and preganglionic motor column cells with projections to the sympathetic ganglia send axons from the inside of the spinal cord to the outside, through the ventral root . The atypical projection of the intramedullary EGFP-positive cells of Six1/4 EGFP/EGFP embryos suggests resemblance to the intramedullary sensory neurons, RB cells, of anamniotes. Appearance of intramedullary sensory neuron-like cells in Six1/4 EGFP/EGFP mice. (A-H) Magenta represents rhodamine-dextran injected outside the spinal cord (sc) (A,B), TLX3 (C,D), KCNA1 (E,F), RUNX1 (G,H) and (I,J) ISL1/2, which are detected in intramedullary enhanced GFP (EGFP)-positive cells (green) in Six1/4 EGFP/EGFP spinal cord. Arrowheads: double-positive cells. (K) Intramedullary EGFP-positive cells (green) are labeled with neural crest cell (NCC) lineage-specific fluorescence of monomeric RFP (magenta). (L) EGFP (green)- and ISL1/2 (magenta)-double-positive intramedullary cells disappear with NCC-specific restoration of SIX1. (M) Number of EGFP- and ISL1/2-double-positive cells in the spinal cord at the level of somite 21 to 26. (N) Schematic representation of dorsal root ganglion (DRG) neurons (blue) and intramedullary neuron-like cells (pink) in Six1/4 +/EGFP and Six1/4 EGFP/EGFP . A-F and I-L are on embryonic day (E)11.5; G and H are on E 12 . A-H, K and L are transverse sections (top: dorsal side); I and J are coronal sections (top: lateral side). Data are mean ± standard error of the mean. *p <0.001. Dashed lines demarcate the position of ectoderm and sc. Scale bars: 50 μm. Xenopus RB cells are Tlx3-positive (see Figure 2). The majority of intramedullary EGFP-positive cells in Six1/4 EGFP/EGFP were positive for TLX3 (n = 6, Figure 4D). The DRG neurons and subsets of differentiated interneurons in the dorsal spinal cord were also TLX3-positive, as reported previously  (Figure 4C), however, these cells appeared normal in Six1/4 EGFP/EGFP (n = 6, Figure 4C,D). The transcript of a Shaker-like potassium channel Kcna1 (Kv1.1) was detected previously in Xenopus RB cells , and we confirmed the protein localization of Kcna1 in RB cells by immunohistochemical analysis (Additional file 2B). In E11.5 Six1/4 EGFP/EGFP embryos, a subset of intramedullary EGFP-positive cells was positive for KCNA1 (n = 3, Figure 4F), although no such cells were observed in the dorsal spinal cord of Six1/4 +/EGFP embryos (Figure 4E). Runt-related transcription factors, Runx1 and Runx3, are expressed in Xenopus RB cells and Runx1 is critical for the development of RB cells [64, 65]. The majority of intramedullary EGFP-positive cells in Six1/4 EGFP/EGFP were positive for both proteins (n = 3, Figure 4H; Additional file 4A), although no such cells were recognized in Six1/4 +/EGFP spinal cord (n = 5, Figure 4G). RB cells are distributed in a non-segmental manner [8, 66], whereas DRG show segmental and symmetrical organization along the body axis. The intramedullary EGFP-positive cells of Six1/4 EGFP/EGFP never showed any distinguishable segmental arrangements (Figure 4I,J). Considered together, these findings suggest that intramedullary EGFP-positive cells have substantial common features with the amphibian RB cells. The sensory neurons in DRG originate from the NCC. Next, we examined whether the EGFP-positive cells in the spinal cord of Six1/4 EGFP/EGFP originate from NCC by employing a genetic strategy to label NCC lineage. By crossing P0-Cre mice, in which Cre recombinase is expressed in tissues derived from NCCs (P0-Cre) , with a transgenic mouse line harboring CAG-loxP-STOP-loxP-mRFP1 cassette (CAG-lxl-mRFP1), the neural crest lineage can be visualized by the red fluorescence of monomeric RFP (mRFP). Virtually all EGFP-positive intramedullary cells in the Six1/4 EGFP/EGFP ;P0-Cre;CAG-lxl-mRFP1 embryos were labeled with mRFP1, indicating that they originated from the neural crest (n = 3, Figure 4K). In the mouse trunk, SIX1 and SIX4 are expressed in somites and the mesenchyme [40, 50] in addition to the DRG. To determine whether the emergence of intramedullary EGFP-positive cells in Six1/4 EGFP/EGFP embryos was caused by loss of functions of SIX1 and SIX4 in NCCs, we restored the expression of SIX1 only in NCC derivatives. For this purpose, we generated a transgenic mouse line harboring CAG-loxP-STOP-loxP-Six1 cassette (CAG-lxl-Six1) and crossed it with P0-Cre mice. The number of EGFP- and ISL1/2-double-positive cells was markedly reduced in the spinal cords of Six1/4 EGFP/EGFP ;P0-Cre;CAG-lxl-Six1 embryos (n = 4, Figure 4L). The abnormal morphology and organization of Six1/4 EGFP/EGFP DRG were also rescued and the DRG resembled those of Six1/4 +/EGFP (Figure 4L, compare with Figure 3). The number of EGFP- and ISL1/2-double-positive cells in the spinal cord at the level of somites 21 to 26 was significantly higher in Six1/4 EGFP/EGFP embryos (1,097.5 ± 113.6 cells/embryo, n = 4, p = 0.00007), compared to Six1/4 +/EGFP embryos (4.0 ± 1.3 cells/embryo, n = 4; Figure 4M). NCC lineage-specific restoration of SIX1 expression markedly reduced the number of these cells to 309.8 ± 33.1 cells/embryo in Six1/4 EGFP/EGFP ;P0-Cre;CAG-lxl-Six1 mice (n = 4, p = 0.0006; Figure 4M). These results suggest that the cell-autonomous function of SIX1 in the NCC primarily suppresses the developmental program responsible for the generation of intramedullary sensory neuron-like cells during mouse development.Taken together, these findings highlight the importance of SIX1 and SIX4 in NCC-lineage in the formation of DRG and preclusion of intramedullary sensory neuron-like cells in mice (Figure 4N). To determine the mechanism and source of intramedullary sensory neuron-like cells, we examined their ontogeny. EGFP-positive intramedullary cells were first observed at E10.5 at the level of the thoracolumbar region in Six1/4 EGFP/EGFP embryos, and their number reached peak level at E11.5 (Figure 5A). The basal lamina marked with laminin-staining was often interrupted by the presence of EGFP- and ISL1/2-double-positive cells at the DREZ in E11 to 11.5 Six1/4 EGFP/EGFP embryos (n = 8, Figure 6E-H), although the gaps of basal lamina were normally occupied by axons originating from DRG neurons in Six1/4 +/EGFP (n = 17, Figure 6A-D). Time-lapse live imaging analysis of slice cultures of the E11 Six1/4 EGFP/EGFP embryos at lumbar level indicated that EGFP-positive cells migrated medially toward the spinal cord and finally into it (n = 5, Figure 6I; Additional file 5). Taken together with the results of labeling and rescue analysis using P0-Cre (Figure 4K-M), medial migration of NCCs into the spinal cord seems a plausible mechanism for the emergence of intramedullary EGFP-positive cells in Six1/4 EGFP/EGFP . Appearance of intramedullary sensory neuron-like cells in Six1/4 EGFP/EGFP mice precedes disorganization of the dorsal root entry zone. (A) Number of enhanced GFP (EGFP)- and ISL1/2-double-positive cells in 10 μm sections of embryonic day (E) 10.5 to 12 Six1/4 EGFP/EGFP thoracolumbar spinal cord. (B) EGR2-positive cells (magenta) at the dorsal root entry zone (DREZ) (arrowheads) and at the motor exit point (MEP) (arrows) do not overlap with EGFP (green) and show comparable distribution in E11.5 embryos of Six1/4 +/EGFP and Six1/4 EGFP/EGFP . ISL1/2 (magenta) marks dorsal root ganglion neurons. (C) Number of EGR2-positive cells in 10 μm sections of E10.5 to E11.5 at the DREZ and MEP of Six1/4 +/EGFP and Six1/4 EGFP/EGFP . (D) Total length of laminin gaps in 50-μm length of basal lamina covering the primordium of the dorsal funiculus. In all measurements, at least five sections from three embryos were used per genotype. Data are mean ± standard error of the mean. *p <0.005. Dashed lines demarcate the position of ectoderm and spinal cord (sc). Scale bar: 50 μm. Medial migration of intramedullary sensory neuron-like cells in Six1/4 EGFP/EGFP mice. (A-H) Abnormalities in the Six1/4 EGFP/EGFP dorsal root entry zone (DREZ). (B-D) and (F-H) show close-up of the DREZ (indicated with rectangles) in Six1/4 +/EGFP (A) and Six1/4 EGFP/EGFP (E). ISL1/2 (magenta/green)- and enhanced GFP (EGFP; green)-double positive cells (arrowheads) are located across the basal lamina, which is demarcated by the immunofluorescence signal of laminin (magenta). The position of nuclei is visualized with DAPI (green). (I) Time-lapse imaging of EGFP-positive cells on the slice culture of embryonic day 11 Six1/4 EGFP/EGFP lumbar region. Top line shows elapsed time of observation. See also Additional file 5. Dashed lines demarcate the position of the spinal cord (sc). Scale bars: 25 μm (A,E,I) and 10 μm (B-D,F-H). To explore the mechanism underlying the emergence of sensory neuron-like cells in the mouse spinal cord, we examined the boundary structure between the CNS and peripheral nervous system (PNS) on the surface of the spinal cord. Boundary cap (BC) cells are known to maintain the integrity of the boundary structure between the CNS and PNS. Specifically, BC cells prevent the emigration of motor neurons at the ventral part of the spinal cord (the MEP) and of glial cells to the periphery at the DREZ [68, 69]. BC cells can be identified by the expression of EGR2 (KROX20) [70, 71]. EGR2-positive nuclei did not overlap with EGFP fluorescence in either Six1/4 +/EGFP or Six1/4 EGFP/EGFP embryos at E11.5 (Figure 5B), and the distribution of EGR2-positive cells located at the DREZ and MEP was not apparently different between Six1/4 +/EGFP and Six1/4 EGFP/EGFP (arrowheads and arrows in Figure 5B, respectively). At E10.5, no EGR2-positive cells were observed at the DREZ (assayed in 14 embryos with 30 to 35 pairs of somites, Figure 5C), although they were observed in the cervical region . EGR2-positive cells were first detected at the level of the thoracolumbar region at E11 (n = 5, Figure 5C) after the appearance of intramedullary EGFP-positive cells at E10.5. At E11, the numbers of EGR2-positive cells at both the DREZ and MEP were not different between Six1/4 +/EGFP and Six1/4 EGFP/EGFP . At E11.5, the number of EGR2-positive cells at the DREZ of Six1/4 EGFP/EGFP (1.1 ± 0.2 cells/10 μm, n = 5, p = 0.004) was approximately half that of Six1/4 +/EGFP (2.2 0.3 cells/10 μm, n = 6), although the number was similar in MEP. These findings indicate that the emergence of intramedullary EGFP-positive cells at the level of the thoracolumbar region precedes that of BC cells in Six1/4 EGFP/EGFP embryos. At E11.5, when intramedullary EGFP-positive cells were largest in number in Six1/4 EGFP/EGFP embryos, the number of BC cells at the DREZ of Six1/4 EGFP/EGFP was smaller compared with that of Six1/4 +/EGFP . We also investigated the distribution of laminin, a major component of the basal lamina, to evaluate the integrity of the boundary structure between the CNS and PNS at the DREZ. Gaps in the laminin layer usually mark the site of penetration of dorsal roots from DRG neurons into the spinal cord (Figure 6A-D) . In Six1/4 EGFP/EGFP embryos, intramedullary EGFP-positive cells could originate from the cells that pass through the gaps and invade the spinal cord in the presence of possible disruption of the border. Gaps in the immunofluorescence signal of laminin were observed in the DREZ of both Six1/4 +/EGFP and Six1/4 EGFP/EGFP embryos (Figure 5D). At E11.5, the total length of laminin gaps in 50-μm length of basal lamina covering the DREZ was significantly greater in Six1/4 EGFP/EGFP (7.2 ± 1.1 μm, n = 4, p = 0.004) than Six1/4 +/EGFP (3.2 ± 0.7 μm, n = 4). The difference was caused by the larger number of laminin gaps rather than longer individual gaps in the Six1/4 EGFP/EGFP DREZ compared with Six1/4 +/EGFP (Additional file 6). However, the total length of laminin gaps was comparable in the DREZ of Six1/4 +/EGFP and Six1/4 EGFP/EGFP at earlier developmental stages of E10.5 and E11, at which intramedullary EGFP-positive cells were already present. These findings suggest that the number of laminin gaps at the DREZ increased after the emergence of intramedullary EGFP-positive cells in Six1/4 EGFP/EGFP embryos. Considered together, the above findings suggest no apparent change in the boundary structure at the DREZ before the emergence of intramedullary sensory neuron-like cells in Six1/4 EGFP/EGFP embryos, and that the number of BC cells decreased while that of laminin gaps increased after the emergence of intramedullary cells. Thus, the emergence of sensory neuron-like cells in the spinal cord of Six1/4 EGFP/EGFP embryos could be due to translocation of NCCs into the spinal cord, and the most probable mechanism for such translocation is a change in the intrinsic properties of NCCs. 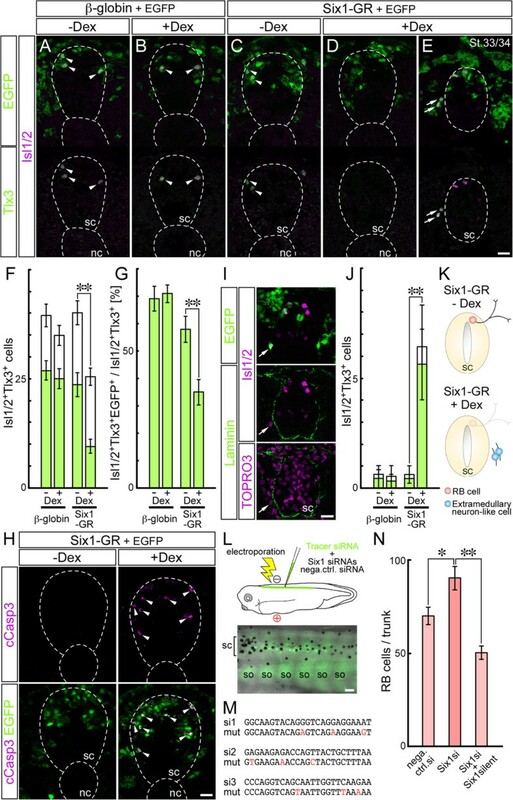 The above findings demonstrated the role of Six1 in the transition of trunk sensory system from RB cells to DRG neurons in Xenopus and in DRG formation and preclusion of intramedullary sensory neuron-like cells during mouse development. Thus, Six genes seem to be involved in the evolutionary disappearance of intramedullary sensory neurons, such as RB cells. In Xenopus, Six1 expression begins in RB cells preceding their apoptotic death during the transition from RB cells to DRG (Figure 1). By comparison, the expression of SIX1 persists from the beginning of mouse DRG development (Figure 3). The expression profiles of Six1 in Xenopus and mouse suggest that the onset of Six1 expression during the entire developmental process of trunk sensory neurons could be different in these species, and that such difference could be the genetic basis of the disappearance of RB cells and exclusive development of DRG. However, the developmental time scale is not the same in Xenopus and mouse, because both species possess their own unique developmental processes acquired after the amphibian-amniotes divergence about 350 million years ago. Therefore, it is difficult to directly compare the timing of onset of Six1 expression between Xenopus and mouse. Accordingly, we focused on a conserved Six1 enhancer (Six1-8) solely responsible for the expression of the gene in DRG neurons , and evaluated the timing of activation of mouse (mSix1-8) and Xenopus (xSix1-8) enhancers under the same environment. We generated transgenic Xenopus in which mSix1-8 or xSix1-8 drives EGFP expression to monitor enhancer activity in vivo. In the trunk of mouse embryos, mSix1-8 activated the transcription in DRG later than E10 . Surprisingly, the enhancer activity of mSix1-8 was observed in Xenopus RB cells at St. 25/26 (75.9 ± 3.8% RB cells, n = 5), before the endogenous expression of Six1, and at St. 41/42 (87.1 ± 1.6% RB cells, n = 12; Figure 7B). By contrast, the activity of xSix1-8 was observed only in a minor proportion of RB cells at St. 25/26 (12.8 ± 3.4% RB cells, n = 7), but became prominent at St. 41/42 (83.9 ± 2.6% RB cells, n = 12; Figure 7A), just with the appearance of endogenous expression of Six1 (Figure 1). Both enhancers showed activity in DRG at St. 49 (Figure 7A,B). These results provide strong support to our notion that Six1 expression appears earlier in trunk sensory neurons of mouse than Xenopus (Figure 7C). More importantly, the earlier expression is likely mediated by modification of a single enhancer that shares sequence similarity between Xenopus and mouse. Mouse Six1 enhancer for dorsal root ganglion neurons directs expression in Rohon-Beard cells earlier than Xenopus enhancer. (A) Xenopus enhancer directed the expression of enhanced GFP (EGFP; green) in Rohon-Beard (RB) cells (magenta, labeled by Isl1/2) not at Stages (St.) 25/26, but at St. 41/42, and in dorsal root ganglion (DRG) neurons at St. 49. (B) Mouse enhancer directed expression of EGFP in RB cells at St. 25/26 and 41/42, and in DRG neurons at St. 49. For A and B, bar graphs show the percentage of EGFP-positive RB cells in 250 μm of the thoracic level. Data are mean ± standard error of the mean. Arrowheads: EGFP- and Isl1/2-double-positive RB cells; dashed lines demarcate the position of the spinal cord (sc); so, somite; drg, dorsal root ganglia. Scale bars: 25 μm. (C) Schematic representation of timing of Six1 expression in Xenopus and mouse. Xenopus six1 enhancer for sensory neurons (xSix1-8) directs the expression of Six1 (red arrow) to alter the sensory system from RB cells (pink line) to DRG neurons (blue line). In mouse, Six1 enhancer (mSix1-8) mediates SIX1 expression earlier during trunk sensory development. This altered timing of SIX1 expression inhibits the development of intramedullary sensory cells and promotes DRG neurogenesis. 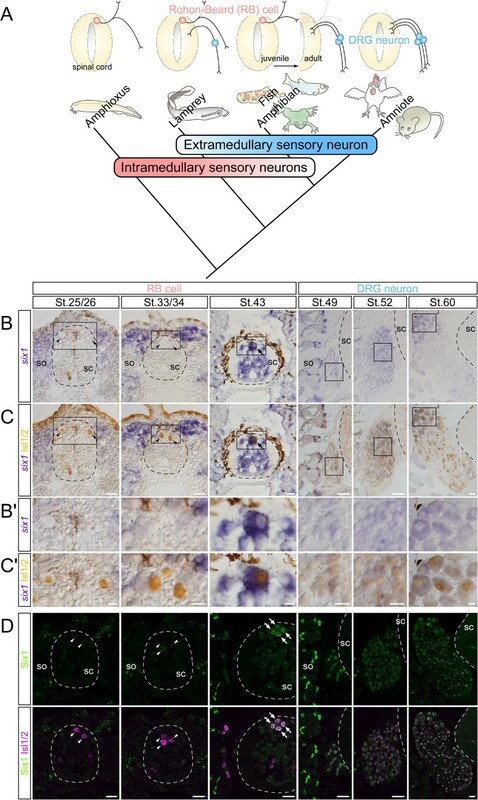 In this study, we found that Six1 is a key regulator of transition from intramedullary sensory neurons (RB cells) to extramedullary sensory neurons (DRG neurons) during Xenopus development (Figures 1 and 2); SIX1 precludes the appearance of intramedullary sensory neurons in mouse spinal cord by preventing NCCs migrating into the medulla (Figures 3, 4, 5 and 6); and the timing of Six1 expression in sensory neurons could be altered by changing enhancer sequences (Figure 7). Previous studies have described the roles of Six1 in proliferation and neuronal differentiation in the sensory systems [41, 42, 48]. The present study describes Six1 as a key regulator of apoptosis during the process of disappearance of Xenopus RB cells and assigning proper location of mouse sensory neurons. Because cdk5 is involved both in apoptosis and positioning of RB cells in zebrafish [29, 76], the differential functions of Six1 might be elaborated by such molecules. It is possible that the precocious disappearance of RB cells in six1-overexpressed Xenopus embryos is caused by reasons other than apoptosis. Defects in the medial migration are expected to reduce the number of RB cells incorporated in the dorsal spinal cord of Xenopus, analogous to mouse development in which the medial migration of NCCs leading to the emergence of intramedullary sensory neuron is precluded by Six genes. Identifying the mechanism of disappearance of RB cells might produce further evidence to understand the evolution of sensory neuron architecture. Surprisingly, sensory neuron-like cells appeared in the spinal cord of Six1/4 EGFP/EGFP , though it is unclear whether they are functional or not. What is the identity of such cells and what does their appearance imply? Intramedullary EGFP-positive cells disappeared by E12.5, probably due to apoptotic cell death (Additional file 4B), which might be induced by inappropriate environment for survival. The disappearance does not allow us to characterize the functional features of such cells as sensory neurons. The sporadic presence of such cells has been reported in amniotes, including reptiles  and human embryos [77, 78]. Intramedullary neurons in human embryos are considered to be homologous to RB cells, because they share anatomical characteristics with amphibian RB cells . Such cells are located in the region where dorsal root fibers enter the spinal cord in human, reminiscent of the position of emergence of intramedullary sensory neuron-like cells in Six1/4 EGFP/EGFP mice. The facts that intramedullary EGFP-positive cells in Six1/4 EGFP/EGFP express NTRK3, TLX3, KCNA1, RUNX1 and RUNX3; possess neurites leaving the spinal cord; and are distributed in a non-segmental manner indicate that they share certain properties with the RB cells. It has been proposed that NCCs and RB cells evolutionarily share a common origin . There are a couple of molecular evidences supporting this scenario: Notch/Delta signaling is involved in segregating the two fates [24, 25], Prdm1 has a role to specify both , and Runx1 is required for the differentiation of both RB cells and subtype of DRG neurons [64, 80]. That intramedullary cells in mouse share some features with RB cells and are derived from NCCs, similar to DRG neurons, suggests common origin of intra- and extramedullary sensory neurons. Despite the fact that both DRG neurons and intramedullary EGFP-positive cells are derived from NCCs, they seem to follow segmental and non-segmental arrangement in Six1/4 EGFP/EGFP embryos, respectively. Segmental arrangement of DRG is determined by NCC-somite interactions [81, 82]. Intramedullary EGFP-positive cells might be relieved from such signaling because they are physically isolated from the influence of somites by the basal lamina. One of the key components of NCC-somite interactions is neuropilin (NRP)/semaphorin signaling. NRP1 and NRP2 are expressed in NCCs and play essential roles in segmental formation of DRG and segmental migration of NCCs, respectively [83–85]. NRP1, but not NRP2, was expressed in intramedullary EGFP-positive cells of Six1/4 EGFP/EGFP (Additional file 4C), although the cells are derived from NCCs. Because genetic ablation of NRP2 results in disorganization of segmental migration of NCCs , non-segmental arrangement of intramedullary EGFP-positive cells in Six1/4 EGFP/EGFP might be due to the lack of NRP2 expression rather than the physical isolation mentioned above. Interestingly, Nrp1, but not Nrp2, is also expressed inside Xenopus spinal cord , where RB cells exist, suggesting that the combined expression of Nrps is a potential molecular basis for the non-segmental arrangement of intramedullary sensory neurons. How do ectopic intramedullary sensory neurons appear in the Six1/4 EGFP/EGFP embryos? Our analysis demonstrated that the incorporation of migrating NCCs into the spinal cord is the most plausible scenario for the presence of such cells. Davidson and Keller  showed that frog dorsal neural tube is remodeled by medial migration and radial intercalation of lateral neural plate, including RB cells, which appear in the lateral edge of the neural plate before neural tube formation. In other words, already-specified RB cells segregate from the border and migrate medially to settle in the dorsal neural tube. A similar morphological event is observed in fish development [28, 29]. The intramedullary EGFP-positive cells in Six1/4 EGFP/EGFP embryos show medial migration into the spinal cord from the outside. Of course, one cannot completely exclude the involvement of other mechanisms in the emergence of intramedullary EGFP-positive cells in Six1/4 EGFP/EGFP in addition to the medial migration of NCCs. Abnormalities in the structure that separates the CNS and PNS at the DREZ could be one such mechanism involved in the process of migration of NCCs into the spinal cord. We observed fewer BC cells and larger number of laminin gaps at the DREZ at E11.5 in Six1/4 EGFP/EGFP compared with Six1/4 +/EGFP . 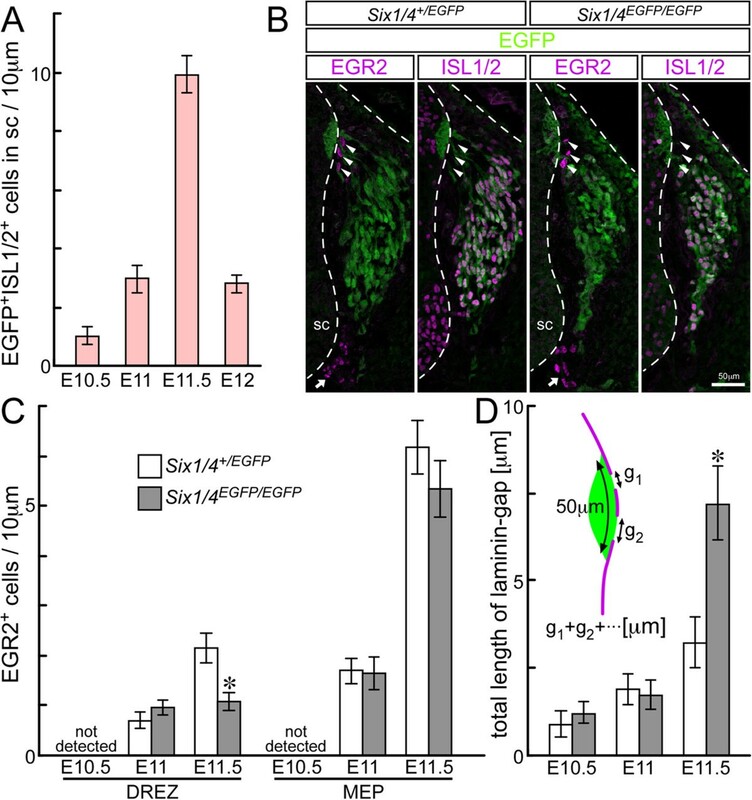 However, the fact that intramedullary EGFP-positive cells were already present at E10.5 suggests that defects in the boundary structure is not the primary reason for the appearance of intramedullary sensory neuron-like cells in Six1/4 EGFP/EGFP embryos. Our data suggest that Six1 is also involved in the evolution of extramedullary sensory neurons or the DRG system. Acquisition of new expression domains of Six1 in the dorsal spinal cord or in the NCC lineage may have contributed to the establishment of the DRG system. The mouse Six1 enhancer for DRG neurons exhibited earlier enhancer activity than Xenopus six1 enhancer in RB cells and precocious overexpression of Six1 caused premature differentiation of extramedullary neurons during Xenopus development. This raises the possibility that the earlier expression of Six1 in the dorsal neural tube, including RB cells and NCCs, was acquired at some point during the evolution from anamniotes to amniotes. This hypothesis can be tested by analyzing the activities of the corresponding enhancers from various species including reptiles and birds. Moreover, the directive role of Six1 in generating extramedullary sensory neurons may have deeper origins. In the amphioxus embryos, Six1/2 seems to be expressed in type I epidermal sensory cells outside the spinal cord ; however, its expression has not been reported in Retzius bipolar cells, which are probably homologous to RB cells. Although there is controversy regarding the vertebrate cell type that is homologous to amphioxus extramedullary type I sensory cells , the expression of Six1 in extramedullary sensory neurons of both amphioxus and vertebrates is intriguing and suggests that Six1 is being recruited as one of the key regulators for generating sensory neurons outside the spinal cord, despite the different evolutionary or developmental origins of the cells. Following the concept that altered expression of developmental regulators is an important step in morphological evolution , evolutionary insights have been made from experimental results obtained through the manipulation of gene expression [89, 90]. Recent work has elegantly demonstrated that the acquisition of a novel enhancer results in a change in gene expression, yielding morphological diversity . This suggests that the upstream mechanisms acting on the enhancer could be established prior to morphological changes. Our findings suggest that changes in the enhancer sequence that caused heterochronic shift in Six1 expression in the trunk sensory precursors of the amniote ancestors could be the genetic basis for the succession from intra- to extramedullary sensory neurons, including the disappearance of RB cells (Figure 7C). In the present study, we used inter-species gene manipulations to show the critical role of Six1 in switching of RB cells to DRG neurons in frog and in the establishment of the exclusive DRG system of mice, coupled with late or early onset of Six1 expression during sensory development. Gain- and loss-of-function of Six1 was demonstrated by experimental changes in intra- versus extramedullary sensory neurons both in frogs and mice, suggesting the conserved function of Six1 in both species despite the different sensory architectures. The species-specific activities of Six1 enhancers, which correlate with the differential onset of Six1 expression in the trunk sensory precursors, could be the genetic basis for the different sensory architecture in frogs and mice. Our findings provide a specific example of how alterations in gene expression can contribute to substantial changes in morphology during evolution. Xenopus laevis embryos were obtained by in vitro fertilization using standard methods  and staged according to . Six1/4 EGFP/EGFP and P0-Cre mice were generated as described previously [48, 57, 67]. Transgenic mouse lines harboring CAG-loxP-STOP-loxP-mRFP1 (containing CAG promoter, floxed stop sequence, mRFP1 cDNA and rabbit β-globin polyA) or CAG-loxP-STOP-loxP-Six1 (containing CAG promoter, floxed stop sequence, cDNA coding N-terminal flag/C-terminal myc-tagged mouse Six1 and rabbit β-globin polyA) cassettes were generated using standard protocols and maintained by backcrossing more than 10 generations to C57BL/6. PCR was performed to verify the genotypes of offspring. Mice were housed in an environmentally controlled room. All animal experiments were carried out in a humane manner after approval of the Institutional Animal Experiment Committee of the Jichi Medical University, and in accordance with the Institutional Regulation for Animal Experiment and Fundamental Guideline for Proper Conduct of Animal Experiment and Related Activities in Academic Research Institutions under the jurisdiction of the Ministry of Education, Culture, Sports, Science and Technology of Japan. Immunofluorescence was performed as described previously  using the following primary antibodies: guinea pig anti-SIX1  (1:5,000 dilution), rat anti-SIX1  (1:2,000 dilution), guinea pig anti-SIX4  (1:2,000 dilution), rat anti-SIX1 (1:2,000 dilution, prepared against chick Six1), mouse anti-ISL1/2 (1:150 dilution of a mixture of hybridoma supernatants, 39.4D5 and 40.2D6, Developmental Studies Hybridoma Bank, Iowa City, USA), guinea pig anti-SOX10 (1:20,000 dilution, prepared against mouse SOX10 peptides), goat anti-NTRK3 (1:1,500 dilution, R&D Systems, Minneapolis, USA), rabbit anti-TLX3  (1:10,000 dilution), rabbit anti-KCNA1 (1:2,000 dilution, Alomone Labs, Jerusalem, Israel), rabbit anti-RUNX1 (1:1,000 dilution, Abcam, Cambridge, UK), rabbit anti-laminin (1:3,000 dilution, Sigma, St. Louis, USA), rabbit anti-cleaved CASP3 (1:1,000 dilution, Cell Signaling Technology, Danvers, USA) and rabbit anti-EGR2 (1:1,000 dilution, Covance, Princeton, USA and Abcam) antibodies. To visualize immunoreactions of primary antibodies, fluorophore (Alexa Fluor 405, 488, 546, 633 and Cy5)-labeled species-specific secondary antibodies (Molecular Probes/Invitrogen, Carlsbad, USA and Amersham Biosciences, Amersham, UK) were used at 1:2,000 dilution. The immunofluorescent images were captured with FV1000 (Olympus, Tokyo, Japan) laser confocal microscope and electronically assigned to green or magenta channels. Nucleotides 355 to 907 of X. laevis six1 (AF279254) were used to synthesize antisense RNA probes labeled with digoxigenin. In situ hybridization was performed as described previously . Following in situ hybridization, Isl1/2 was detected by immunohistochemistry using mouse anti-Isl1/2 antibody (mixture of 39.4D5 and 40.2D6) and VECTASTAIN Kit (Vector Laboratories, Burlingame, USA). Retrograde-labeling was performed as described previously  with slight modifications as follows. E11.5 mouse embryos were dissected and cultured in mouse Ringer’s solution oxygenated with carbogen (95% O2 plus 5% CO2) for 30 minutes to heal any cut edges that may incorporate the dye. Then a slit was made from the surface ectoderm overlying somites through DRG at the level of the thoracolumbar region and filled with lysine-fixable 3000 MW tetramethylrhodamine dextran (D3308, Molecular Probes/Invitrogen). The embryos were cultured for another 6 to 10 hours at room temperature to permit retrograde transport of the label and then fixed for immunofluorescence. GR cDNA was amplified from pSP64T-MyoDGR  by PCR and inserted into pCS2+ harboring an ORF of X. laevis six1 (AF279254) to generate a cDNA encoding C-terminal GR fusion X. laevis Six1 protein. The mRNA preparation, embryo manipulation and microinjection were performed as described in detail previously . A total of 100 to 250 pg/embryo of β-globin or 100 to 125 pg/embryo of Six1-GR mRNA was co-injected with 400 pg/embryo of EGFP mRNA. The Stealth RNAi siRNA Negative Control Med GC Duplex and Stealth siRNAs targeted to Xenopus six1 were purchased from Invitrogen. A mixture of equimolar amounts of si1 through si3 (Figure 2M) was used for validation (Additional file 2C) and in vivo electroporation. Xenopus embryos were anesthetized with 0.075% ethyl-3-aminobenzoate methanesulfonate (Tokyo Chemical Industry, Tokyo, Japan) dissolved in 0.1× Modified Barth’s Saline (MBS) and then transferred into an electrode chamber filled with 0.1× MBS. The anode and cathode platinum electrodes (5 mm in height and 10 mm in width) were fixed on a glass dish with a 15 mm gap and integrated into a resin to establish a square chamber (CUY520P15, Nepa Gene, Ichikawa, Japan). siRNA negative control (200 to 400 μM) mixed with mRFP1 mRNA (150 ng/μl) as a control, or Six1 siRNAs (200 to 400 μM) mixed with mRFP1 mRNA or mutated Six1 mRNA (150 ng/μl) were injected into the region between the spinal cord and dorsal ectoderm in the trunk using a glass micropipette. Just after injection, the dorsoventral axis of the embryos was aligned to the current direction and then electric pulses were applied at 105 V, with 50 ms length, 950 ms interval, and 5 shocks by the electroporator, CUY-21 (Nepa Gene). Embryos were cultured in 0.1× MBS at 19°C. To abolish the knockdown effect mediated by all Six1 siRNAs, three silent mutations in each siRNA-targeted regions were introduced (Figure 2M). The PCR primers were designed to contain mutations and used to amplify DNA fragments. The DNA fragments were joined using In-Fusion HD Cloning Kit (Clontech/TaKaRa, Otsu, Japan), with the protocol supplied by the manufacturer, and verified by DNA sequencing. Live imaging analysis was performed as described previously  with slight modifications as follows. Transverse slices of E11 thoracolumbar region (approximately 300 μm) were prepared using Gastromaster microdissection device (GST-1, Nepa Gene). Scanning was performed with a 10× objective lens in the interval of 7.5 minutes using FV1000 (Olympus) laser confocal microscope. The enhancer sequences of Xenopus Six1-8 (JGI4.1:scaffold_68 3239865–3240552) and mouse Six1-8 (chromosome:NCBIM37: 12:74156389–74156926) were amplified from X. tropicalis and mouse genomes , respectively, by PCR and cloned into the ISpBSIISK + βGFP vector . The nomenclature of enhancer sequences was based on a previous report . Transgenic Xenopus embryos were generated as described previously . EGFP expression was detected using a rabbit anti-EGFP antibody (1:2,000 dilution, MBL, Nagoya, Japan). All values are expressed as mean ± standard error of the mean of at least three independent assays or littermates. Differences from the control experiments were evaluated with Student’s t-test. A probability of less than 5% was considered statistically significant. The authors thank M Akima, H Ikeda, Y Suto and K Mogi for the technical assistance; C Birchmeier for TLX3 antibody; HL Sive for pSP64T-MyoDGR plasmid; H Yokoyama and K Tamura for Xenopus embryos; K Sharma and M Yamakado for helpful advice; M Takahashi and K Tamura for comments on the manuscript; and S Yonei-Tamura for the schematic diagrams. This work was supported by grants from MEXT (#18390061 to KK, #19790156, #21790189, #23790234 and #25460251 to HY), the NIBB Cooperative Research Program (8–134), Jichi Medical University Young Investigator Award, MEXT-Supported Program for the Strategic Research Foundation at Platform in Private Universities (2008–2012) and JST-CREST (to HOg). HY was involved in the conception and design, data collection, analysis and interpretation, and manuscript writing; MS, HOc, HOg and NU in data collection and data analysis; KI and KY in provision of study material; SS in data interpretation and provision of study material; KK in conception and design, data analysis and interpretation, and manuscript writing. All authors read and approved the final manuscript.